I made puddin' today! What did you think I was talking about? Hehe! This morning I baked up some Apple Puddin' and it came out surprisingly better than I thought! The only that I would change is the sweet factor if you feel like having a rich breakfast. It wasn't too sweet so that's good in my opinion. 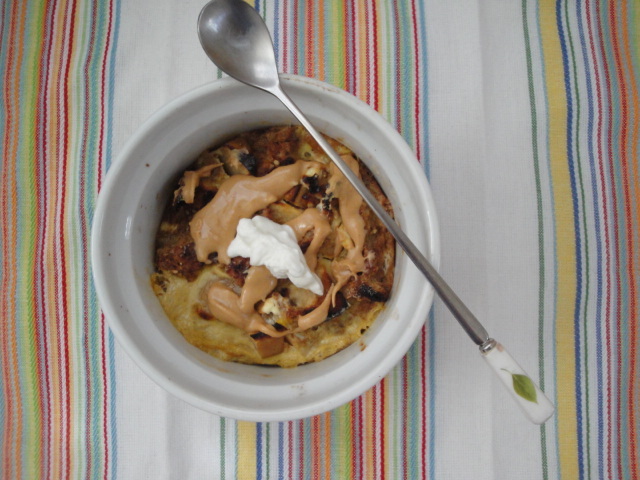 You can pretty much adjust this recipe to your own liking and still have a wholesome breakfast. First, lightly oil or spray a ramekin/baking bowl. Preheat the oven to 350 degrees F. Set that aside. In a medium bowl, whisk together the milk, vanilla, egg, maple, cream cheese, and spices. After that's finished, toss in the apple cubes and bread pieces into the wet ingredients. Evenly coat all the chunks and add in the pecans. I say that broiling makes a large difference because it gives it a more solid and crunch factor, even though the inside is soft and moist! Voila! You have an easy breakfast puddin' that serves 1. C'est tres delicieux! Instead of cream cheese you can sub it with TOFUTTI instead. I also drizzled mine with some natural peanut butter and FAGE GREEK YOGURT. If you try it out, I hope you enjoy it as much as I did!